Moscow, June 18, Interfax – The Moscow Patriarchate believes that the creation of “a unified local church,” for which the country’s administration is calling, may have fatal consequences for the global Orthodox Church. “Our unity with the Orthodox Church worldwide is real and undoubted for all its children. I am certain that the hierarchs, the clergy and the flock of the Constantinople Orthodox Church, like all other Local Churches, understand that and feel the same way. And our common duty now is to make every effort to prevent this unity from being destroyed and to avoid a new schism, a deeper and more serious one, that might arise from supposedly solving this schism. 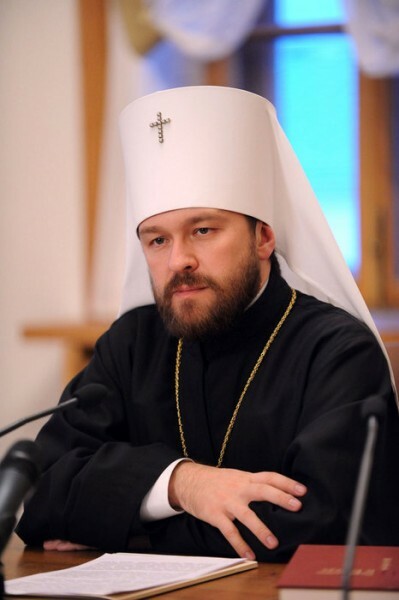 The new schism will cut into parts the whole body of the global Orthodox Church,” Metropolitan Hilarion, Head of the Moscow Patriarchate’s Department for External Church Relations, said in an interview with Interfax-Religion. For those who are outside the Church, who are already divided by a schism from it, church unity does not mean anything, “it is really a phantom, just a sound for them,” the metropolitan said. “They are ready to continue undermining it to secure their interests and the interests of a specific political administration,” he said. “The inter-Orthodox agreements on the issue of granting autocephaly exist. I am surprised to hear that they didn’t exist. The document Autocephaly and Means of Proclaiming It was drafted and approved by the Orthodox Center of the Constantinople Patriarchate in Chambesy. All local Churches, including the Constantinople and Russian ones, signed it 25 years ago,” Metropolitan Hilarion said. The document contains a clear and detailed description of the main two aspects, he said. Firstly, autocephaly is granted to a specific part of a local Church with the consent of the Patriarchate to which this church region now belongs. Secondly, autocephaly is granted with the consent of the Assemblies and all other autocephalic Churches, the metropolitan said. The document was updated and was approved at the inter-Orthodox preparatory commission in Chambesy in December 2009, he said. “In my view, it’s a model for achieving all-Orthodox consensus. Initially, all local Churches had different viewpoints on this issue, but as a result of free and fair discussions they managed to achieve a compromise that suited all parties and took into account all positions,” the metropolitan said. “Ignoring and overturning the very mechanism for granting autocephaly, which was developed by all Orthodox Churches together, means nixing the results of their interaction in the past 25 years,” he said. Metropolitan Hilarion said he doubts that the 12,000 communities, thousands of clergymen and monks and hundreds of monasteries of the Ukrainian Orthodox Church will agree with the attempt to decide their future behind their back.